The Maihak shaft power meter is designed to measure the shaft speed and shaft torsion of sea-going vessels with highest accuracy and repeatability. The PLC display unit HOMIP processes these measure-ments and calculates the resulting shaft power. Those and other key performance indicators (KPI) values are shown on the PLC touchscreen and are also logged on the PLC memory card. 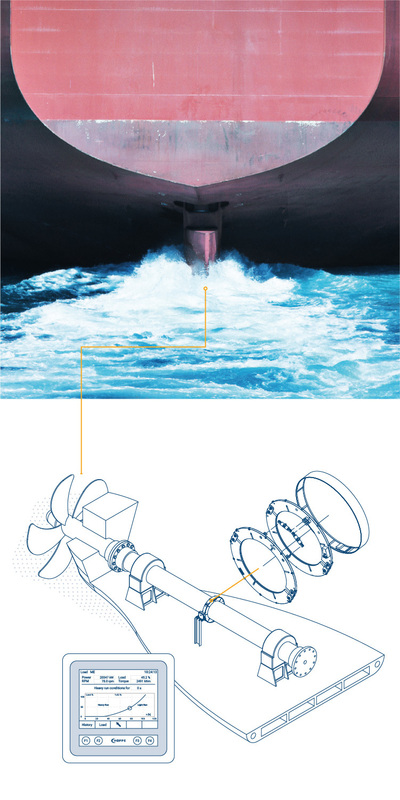 Its purpose is to monitor and control shaft torsion, rotation and power, in order to avoid heavy load conditions, allowing the crew’s manual optimization, monitor specific cylinder oil and fuel consumption and evaluate hull and propeller efficiency. Today, and since the beginning of the shaft power measurement the ship industry, Maihak was and is a market reference leader. With more than 900 installed systems Maihak has become a synonym for shaft power measurement. This in combination with high quality production (Made in Germany) has made Maihak what it is now – a highest quality product that we are all proud of. The measuring principle of the Maihak shaft power meter is based on two acoustic vibrating string sensors. They operate at a natural frequency of 600 Hz. These sensors are installed on the shaft ring. Due to their alignment one sensor will be stretched and the other will be compressed when the shaft is twisted by the torque. The stretched string will create a higher tone (increase its frequency) and the compressed sensor will create a lower tone (decrease its frequency). By determination of the frequency-dependent behavior of every single sensor a fully calibrated system is supplied from the factory. With this information, the differential frequency between both sensors can be translated to the mechanical twist of the shaft. Additionally, the shaft speed is measured with a gyroscope, an accelometer and a hall sensor. The product of the mechanical twist and the shaft speed is the shaft power.